More and more parents and nanny agencies are requiring nanny candidates be vaccinated for the flu, whooping cough, and measles. While some people may have allergies to specific vaccines and cannot get vaccinated, the Center of Disease Control (CDC) shows why child care providers should be vaccinated. Even healthy people can get very sick from influenza (the flu) and spread it to others. The CDC lists that hundreds of thousands of Americans are hospitalized each flu season and that flu viruses circulate at higher levels in the U.S. population. Each year, millions of children get sick with seasonal influenza; thousands of children are hospitalized and some children die from flu. Children younger than 5 years and especially those younger than 2 years are at high risk of serious influenza complications. An annual seasonal flu vaccine is the best way to reduce your risk of getting sick with seasonal flu and spreading it to others. When more people get vaccinated against the flu, less flu can spread through that community. Pertussis, also known as whooping cough, is a highly contagious respiratory disease. Pertussis can affect people of all ages, but can be very serious, even deadly, for babies less than a year old. There are whooping cough vaccines for babies, children, preteens, teens, and adults. The CDC urges all caregivers and family members that come in contact with a baby make sure they get a pertussis vaccine at least two weeks before meeting a baby. Measles is a very contagious virus that is particularly dangerous in children under age 5. The disease can be spread to the fetus of pregnant women, threatening the fetus. It is easily spread through the air when an infected person coughs or sneezes. Measles can easily be prevented by receiving the MMR vaccine. In 2014 there were 667 cases of measles in 27 states and in just one month, 121 new cases of measles were reported in the United States. In February 2015 a total of 125 measles cases had been confirmed linked to two Disney theme parks in Orange County, California. The majority of people who got measles were unvaccinated. Vaccinations have been a polarizing subject because of a discredited report in the Lancet about 18-years ago. Some believe the MMR vaccine causes autism. This belief has been discredited by scientific study. Even those who authored the study have discredited their findings. Therefore, the overwhelming majority of doctors and public health officials agree the vaccine is safe and recommend everyone who can be vaccinated with the MMR vaccine be vaccinated. Clearly the vaccine works. 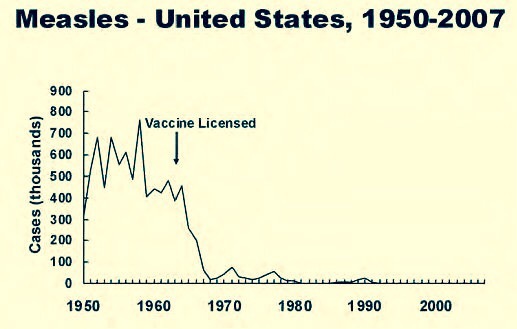 The chart above shows that measles rates have plummeted after the introduction of the vaccine. While many workers may be required to be vaccinated, the nanny industry is unregulated. So, it is a personal decision parents to require their nannies be vaccinated, or not. Nannies may lose job opportunities if parents and agencies require their job candidates be vaccinated. So it’s in their best interest to be immunized. Of course some people cannot get immunized due to allergies. Concerned nannies should discuss their worries about vaccines with their doctor. They can ask their doctor for a MMR Titer Test to see if they need the vaccine. Visit our Facebook page and follow us on Twitter to discuss this topic further.